Horse nails are never made by hand now for the market, but there are yet quite a number of blacksmiths in the business who have to make their own nails as well as shoes. The author’s first lesson in blacksmithing was the making of nails. His first penny earned was from horse nails. Making nails is a good exercise while learning the first steps in the trade. It may happen that a man must make his nails, at any rate every smith should know how to make them in case an emergency should arise. To make a nail, first, get a nail rod 1/2” x 3/16” soft steel or Swedish iron. Point the nail, as shown in Fig. 9, and cut off as indicated by the dotted lines at 1 and 2. The nail marked 1 is a calk nail, so called because it has a sharp pointed head, and when the calks are worn down a few nails are pulled out and these sharp headed nails are driven in their places, and the horse will be all right for a few days. This nail is made in the same was as No. 2 in the start. 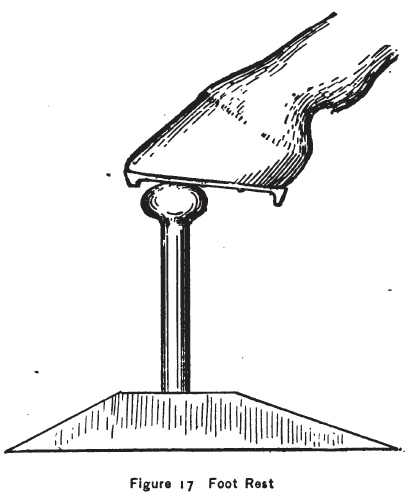 After it has been forged down over the edge of the anvil, as shown in cut, then bend the nail over as shown in No. 1, and cut off over the hardy as indicated by the dotted lines. No. 2 is a common nail. As smiths never make horse nails except for special work I take pleasure in recommending the “New Standard” nail. This is a high grade nail made of the best Swedish iron and manufactured by the Standard Horse Nail Co., New Brighton, Pa. It is very amusing to hear the talk the different horse shoers put up in regard to horse nails. One will tell you that the “Copewell” nail is the only nail, another the “Putnam” and still another the “Star” nail. Now it is a fact that these are good nails but not any better than any other nail, the shoer has simply got used to their shape and has the full confidence in the quality of the nail, and this is of course essential in all affairs for if you have not the confidence in your material you will not have confidence in your work and if you have not, you will fail to infuse confidence in your work to others and the result is that you fail; for if we are possessed with the magnetism of confidence in anything we undertake this same magnetism will be felt by those we deal with and success is assured. This nail is hard enough to drive in the hardest hoof, yet soft enough to clinch easily. If poor iron is used in making nails they are liable to split and lame the horse, even causing death by lock-jaw. Fig. 11 shows how a nail may split striking the coffin-bone. In England a nailless shoe has been invented and patented; but I am of the opinion that this shoe will not be of any practical value. It would indeed be a boon to horseflesh if such a shoe could be invented, enabling us to dispense with the nails. When we bear in mind that the wall of the hoof consists of thousands of hair-like tubes, cemented together, and that each tube is one of a great number of minute canals, which diffuse throughout the horn a fluid that nourishes and preserves the hoof, it can be readily understood that each nail driven into the wall closes every one of these little tubes through which it passes, thus partially cutting off the supply of a substance necessary to the foot’s existence. The best thing we can do, therefore, is to use small nails, and as few as possible. If the shoe has a level and tight bearing there is less strain on the nails, but if the leveling of the foot is carelessly done, no style of nail will prove efficient no matter how many are used and of what size. The foot of a horse is quite a complicated piece of machinery, and experience has taught that no arbitrary rule can be laid down which will work in all cases. In leveling the foot be sure that it is level. Do not cut down the bars by making a V-shaped cut into the heel of the foot, between the bars and the frog, as was done by our ancestors. The bars serve as braces to hold the foot together and in proper shape, preventing contraction. The frog should not be pared as it is intended as a weight bearing cushion. In a healthy unshod foot it always projects below the level of the sole, hence its utility in obviating concussion, supporting the tendons, and on slippery ground it prevents falling. No rule can be laid down for the angle of the foot, but we shall consider that in a future chapter, treating on the shoeing of trotters. The sole should bot be cut into more than just enough to remove the loose scales. The wall should not be cut down so low that the shoe will rest on the sole. The shoe having been fitted and the foot prepared for the shoe, we will now drive nails and fasten the shoe to the hoof. Before the first nail is driven the shoer should be sure that the shoe is placed straight on the foot; this done, start first with one of the front nails. When the first nail is driven it will be noticed that the shoe has moved back on the foot and also over to the opposite side of the foot from where the first nail has been started; in order to guard against this it is best to set the shoe out a little over the first nail, because the shoe will in every case slide back a little in driving the first nail. The nails should be driven so that they will follow the wall, that is, the nail should not be started too far in under the foot. But if the nail is started in line with the wall it can be driven to within half an inch from the coronet without pricking the horse. When the nail is driven there are two ways to dispose of the point of it after it has penetrated the wall. 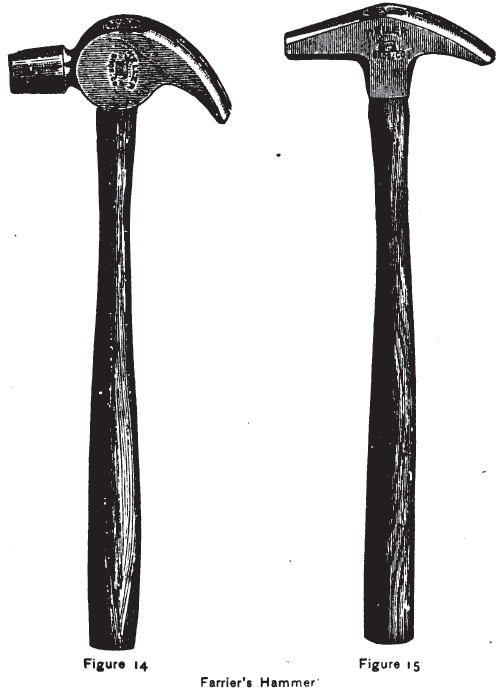 One is to twist the nail off with the claw of the hammer; the other is to bend the nail forward snug up against the hoof. There has been a difference of opinion between horseshoers as to which of these methods is the better. Both of these methods are all right. There are advantages found in one not found in the other on both sides, and the author cannot see why one method is not as good as the other. When the nails have all been driven, nip the nail points off with the pincers. Be sure not to cut them too long, for if you do the clinches will not be strong, and they will look large and clumsy, and if they are cut too short they cannot be bent over at all, which should be done in order to make a strong clinch. When the nails have all been driven, place the clinch iron on the clinch and strike with the hammer lightly on the head of the nail in order to draw the clinch. It is better to strike many easy blows than to strike a few hard ones; for if the nail is driven close to the quick then that side is soft and the nail is apt to bend that way under hard blows, which results in laming the horse. Before the clinches are clinched remove the chips from the under side of them; these chips are forced out by the nail in driving it. Some shoers will rasp these off, making a deep crease in the hoof from the heel to toe. This is unwise, and will do a lot of harm to the hoof. The best way is to have a narrow chisel, and just cut off the chip forced out by the nail. Next, place the clinch tool on the head of the nail and bend the clinch over with the hammer, or if the horse is nervous or has a sore foot, use the clinch tongs instead of the hammer. The clinches should be short and hammered down snug. It is claimed by some that there is no need of clinching the nails at all. Now that might be all right on a horse hoof that is easy on the shoes and has a hard, healthy hoof, but for a draft horse it will not do. When this idea was first presented to me I gave it a fair test. In shoeing a farm team I shod one of the fore feet according to this method. The next day the farmer brought this team back, carrying one of the front shoes in his hand, claiming that I had forgotten to clinch one of the fore shoes. This settled that method with me forever. The clinches all done, we now come to that part of the job that is done by every shoer; but should be done by none, i.e., the rasping off of the hoof. But how can the poor horseshoer avoid it? 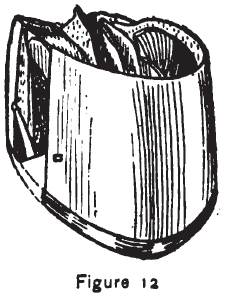 The cases are rare where the foot is so uniform in shape that a shoe can be fitted which will follow the outer edge of the wall in its entirety, the feet being mostly worn off, or nicked, and sometimes grown out in projecting points, and it is impossible to fit a shoe to such a foot without rasping. Not one foot in a hundred is of a uniform shape, still we are told not to touch the hoof with the rasp. We all agree it would be better not to do so, but no man would accept a job of that kind. The best that can be done is to fit the shoe so that as little as possible is rasped off. It is a common fault with all shoes that the holes are punched too far out on the web of the shoe. If the holes were punched further in there would be less rasping to do. Of course the projecting parts must be rasped off in all cases. 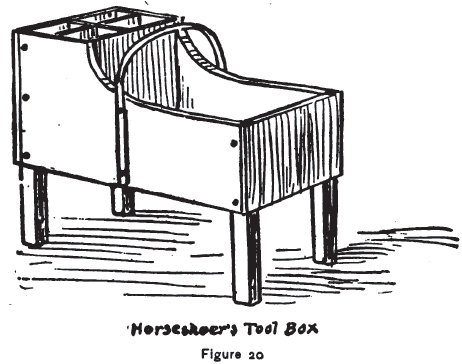 There are horseshoers who claim that they never rasp the foot, but if you watch them you will find that they rasp the foot in paring to a uniform shape, and then, of course, it is easy to fit the shoe, so that no rasping need be done after the shoe has been nailed on; but whether they do the rasping before or after the shoe is nailed, they will rub some oil on the rasped part and tell you, “I never rasp the hoofs. It is the other fellow who is doing some botch work, but not I.” It is true that there are shoers who will rasp the foot from the coronet to the sole level, but his kind of shoer is an exception. The hoof is covered by a fine coating of natural varnish, thickest at the upper margin. Under this varnish the new hoof is secrete and protected until is has developed. In the rasping this varnish is destroyed, and as a result the foot will become dry and shrink, causing contraction and a diseased foot. 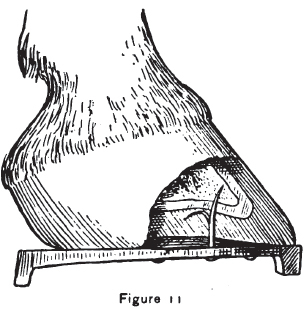 Whenever hoof has been rasped it should be painted to prevent the air from drying up the hoof, and also preventing the hoof oil from drying up. If rasping could be done away with entirely it would be best, but as it cannot be, let us reduce it to a minimum.